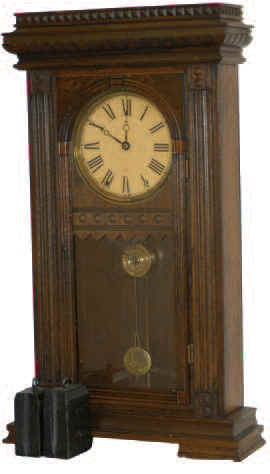 Waterbury Clock Co. mantle-weight clock, "Elberon", ca 1887. Large walnut shelf clock that is 32.75 inches high, with the original finish peeking thru under the smoke and grime. It will suit some people as it is, but I would prefer some Kotton Kleanser be applied if I were going to keep it. Full label on the back with a 5-10% paper loss. The two old weights and pendulum are running the clock, who knows if they are original. The paper dial is a replacement and I would suspect the glass has also been replaced. 8 day movement, strikes hours on a cathedral gong with a brass base. In good near original condition, this clock would be expected to fetch $1000 or more, hence the low minimum. Ly- Waterbury No. 1478.